Welcome to Wee Wild Sparks! 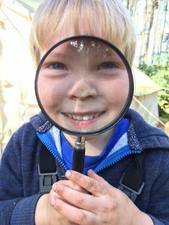 ​Wee Wild Sparks outdoor nursery is a fully registered nursery providing quality day care for children aged 3 - 7, in an idyllic outdoor setting. We are based in 7 acres of mixed woodland, on a private estate, on the edge of Coupar Angus and Burrelton, PH13. We are currently open on Mondays and Tuesdays and have spaces now for both days.